This chart and the comments below are designed to help you narrow the choices so your client has the best choice for their specific needs. We understand you are busy, with more problems than time. We understand the temptation to 'grab what is handy' or use 'what you always use'. 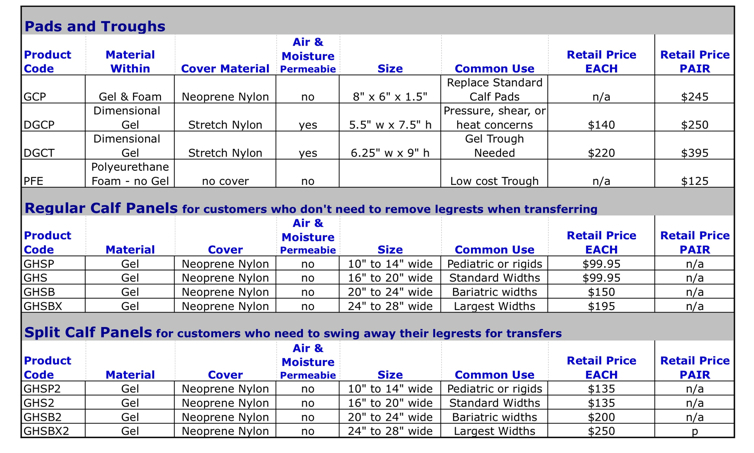 We hope that this page helps making the right choice of calf pads easier for you. Issues like underlying diagnosis and level of client risk are a little beyond the scope of this page. What we're talking about here are the differences in pad characteristics that deal with materials, comfort, weight and cost. The table above provides a good quick summary of our current offerings. Gel Ovations heritage is as a spin off from Falcon Rehabilitation. Our newest calf pad comes from their parental cleverness. By creating an adapter plate with screw holes having the proper spacing, they turned one of our footplate covers GFPC -- into the new calf pad: GCP. GCP offers great comfort, durability, and visual appeal in a 6"w x 8"h FLAT GEL calf pad. If you are looking for a flat pad, WHY NOT choose this one? It fits chairs with more than 12" between the leg rests. Two other GEL options are made with Dimensional GEL so they keep their softness in all temperatures, reduce shear, and allow for heat and moisture to be channeled away. The DGCP - Dimensional GEL Calf Pad is 5.5"w x 7.5"h AND curved both side to side and top to bottom to provide great support in all directions. When a deeper trough is needed for stability, the DGCT Dimensional GEL Calf Trough is an excellent choice - 1" deep and 6.25"w x 9.25"h.
All these PADS have screw holes to fit the 1.5" or 2" spacing found on most legrest hardware. Note: Prices in this chart are subject to change. If different, the prices on this site for the individual items supercede the prices in this chart.